Two officers were commissioned in December 16, 1915 in the 161st Huron Battalion. One of these officers did not return home at war’s end. MAIR, (Lieutenant) James Knox, who had received prior army training while working with the 33rd Hurons was pictured in the photograph, Officers of the 163. He was seated in the front, sixth on the left. O’NEILL, (Lieutenant) William Earl was commissioned on December 16, 1915 in C Company. Prior to WWI, Bill O’Neill worked in the O’Neil family grocery store. Seven men enlisted on December 16, 1915 in the 161st Huron Battalion. One of these seven men did not return home at war’s end. 654021, COOK, (Pte.) Willett “Glen”, bandsman was photographed by photographer, A.P. Taylor, while Pte. Glen Cook was overseas in England. 654046, HINSCLIFFE, (Pte.) William Lewis, “A” Company enlisted at Wingham, which was his hometown prior to WWI. His next of kin was listed as Mrs. H. Hinscliffe of Wingham. According to his profile in the publication, Huron County War Memorial, he was one of A Company’s buglers. In Huron County War Memorial, Pte. Will Hinscliffe WWI army duty was outlined on page 49. It reports that “Will is the son of Mr. and Mrs. H. Hinscliffe of Wingham. 654319, O’BRIEN, (Pte.) 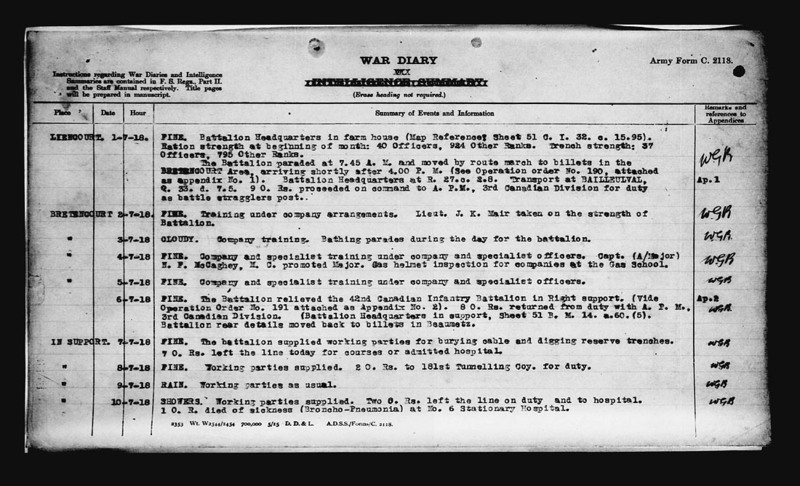 Ernest Patrick, “B” Company enlisted in Goderich. He was a native of Ireland. Private E.P. O’Brien’s next of kin was Mrs. Kate O’Brien of Norwich, England. 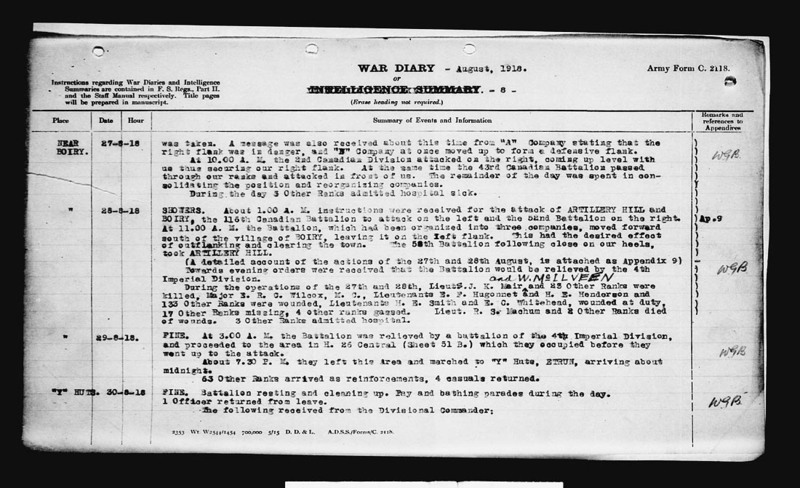 Further data from the 1916 Canadian Militia Roll indicates that Ernest O’Brien had acquired prior military experience with Imperial Forces. Although Ernest Patrick O’Brien may have been a member of the 161st’s Goderich Company, he has not yet been identified in a World War One Camp Borden photo of those from the Goderich area. 654076, PARKER, (Pte.) Wilbert Roy, “D” Company was one of the three Parker brothers (Arthur, Gordon and Bert) to enlist and go overseas with the 161st. Private Bert Parker was photographed with Hensall’s Own. He was seated on the ground, second from the left. 305134, RIVERS, (Sgt.) Thomas Lloyd, “C” Company enlisted with a Toronto regiment and later transferred to the 161st Huron Battalion. His next of kin was C. Rivers of Exeter. 654095, SNELL, (Pte.) William “Maitland” was a member of Blyth’s Own and enlisted in Blyth. He was one of two brothers to enlist with the 161st detachment at Blyth. Both Private Maitland Snell and Private Stan Snell are pictured with Blyth’s Own. In Huron Overseas, the photo of Blyth’s Own showed William Snell kneeling in the third row, fourth from the left. 654114, WELLS, (Pte.) Richard, “C” Company enlisted at Clinton. His next of kin was listed as Mrs. Annie Whistle of Paragon Row, London, England.